Readings are 1 and a 1/2 hours in duration, on average, and focus on the core themes of your individual horoscope and the'outlook' for your life over the coming 12-18 months. 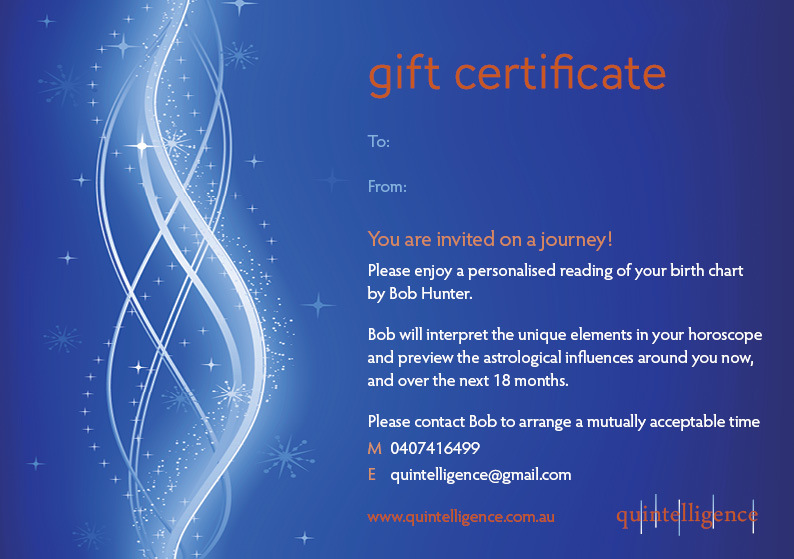 Costs are A$125 for a personal/recorded reading and A$90 for a personalised written report. Cost for a combined personal/recorded reading and written report is A$200. I also undertake readings focused on relationships, business or other specialised requirements. Cost by negotiation. 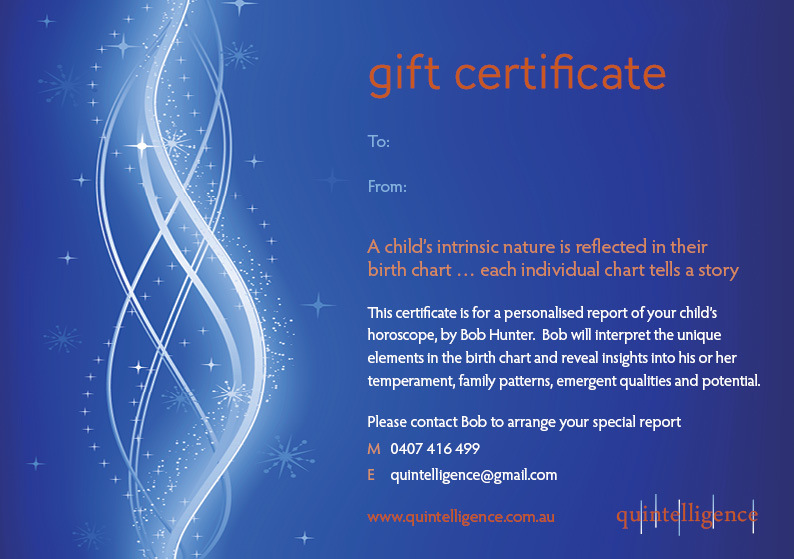 Preview Gift certificates for chart readings and children's chart readings. In addition to our standard written reports we provide beautiful decorative reports featuring artwork by 'friends' of quintelligence. From our portfolio of original pieces an image is selected that I feel best fits the overall energy of the individual horoscope. The image is integrated into a specially designed and bound report that will inspire......and can be referred back to time and time again. Cost is A$125 plus postage. Our decorative charts are particularly meaningful for children's horoscopes, capturing as they do the intrinsic possibilities of one who is only beginning his or her journey into life's many and varied experiences. With children's charts I focus on their emergent individual qualities and potential, with the intention of assisting parents, families, friends and teachers to appreciate and nurture the unique being in their care. A range of classes and workshops, part of the LIFE│BALANCE series, are conducted in convenient locations in metropolitan Sydney. An introductory 10 week course outlines the fundamental principles of astrology and provides a platform of skills necessary to begin to interpret the rich tapestry that is our personal horoscope. For those seeking a deeper understanding of the many layered world of astrology, intermediate and advanced classes are offered. Relating astrology to everyday life situations - home, career, family and relationships. We also conduct workshops during the year on designated themes. Please contact us.